Olivia Trice puts on the brakes inside the paint to put up a shot as Alyssa Hall defends. Jaida Wolfork gets fouled by Anna Landing. Nyla Hampton drives for a layup ay Beavercreek. Destiny Bohanon drives past a pair of defenders to score during the first half. 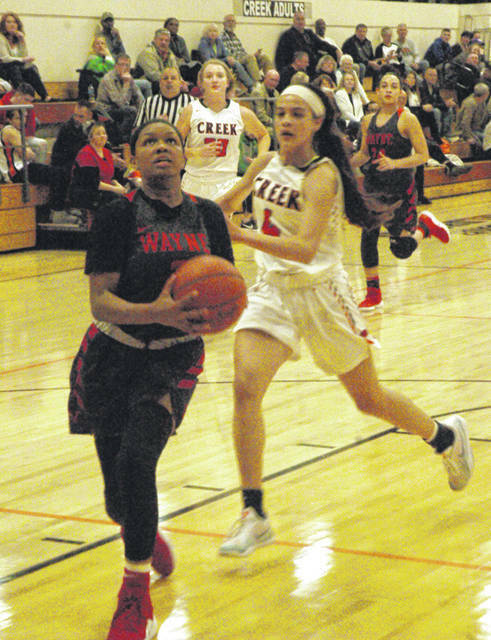 BEAVERCREEK — Great players make great shots in clutch situations and Wayne senior guard Destiny Bohanon came up with a big one Wednesday at Beavercreek at the buzzer. 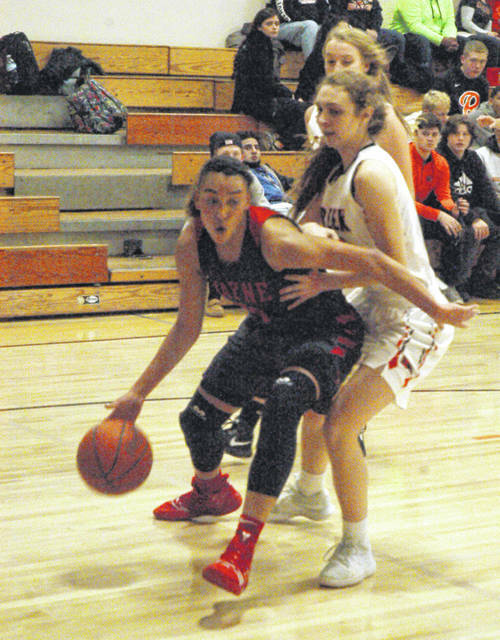 With Wayne trailing by a point Bohanon managed to split a pair of defenders as she drove into the right side of the lane near the baseline to score the apparent winning basket at the buzzer. Unfortunately an official called Bohanon for a player control foul to negate the score. She barely grazed either defender. 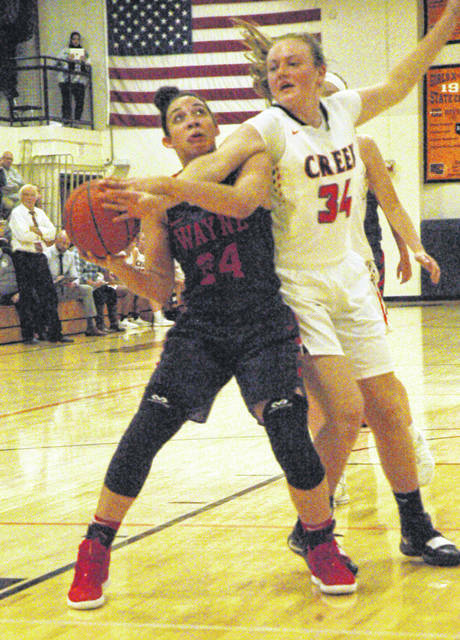 The foul allowed Beavercreek to walk away with a hard-fought 54-53 division victory to hand Wayne its first loss of the season. With the win Beavercreek improved to 2-2 overall and 2-0 in conference play while Wayne fell to 3-1 and 1-1 in the conference. 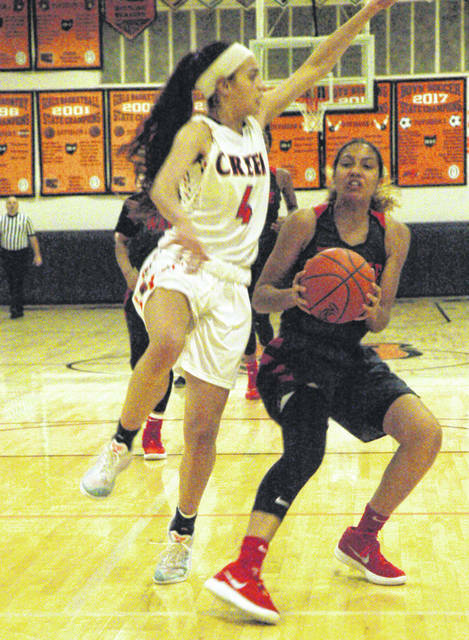 Coming up with a big victory over National East division rival Wayne was a boost to a Beavercreek team reeling from a 76-37 shellacking Saturday at the hands of Cincinnati Mt. Notre Dame. From the outset the game saw both teams commit plenty of turnovers. Wayne managed to take a 14-7 lead by the end of the first quarter but Beavercreek got a 3-pointer by Maci Rhoades, a free throw by Tiernan McKitrick and a bucket by Alyssa Hall to take a 19-17 lead. Wayne countered with a 3-pointer by Bohanon followed by a pair of steals and baskets by Aubryanna Hall and Nyla Hampton to regain the lead 24-19. The Lady Warriors held a 27-21 lead at halftime. Kyra Willis scored early in the third quarter to boost Wayne’s lead to 29-21 but Beavercreek fought back. Kirsten Williams scored and drew a foul with less than a second left in the period and sank the bonus shot to knot the score at 34. Hall and Hampton scored back-to-back 3-pointers to put Wayne up 40-34 at the start of the final period. Bohanon buried a trey to make it 43-35 and the Lady Warriors appeared to be in the driver’s seat. Beavercreek got a basket by Maggie Holstein, a free throw by Kirsten Williams, Alyssa Hall buried a 3-pointer and Taylor Steinbrunner scored inside to cut Wayne’s lead to 43-42 with 2:51 remaining. Bohanon sank a pair of free throws with just under a minute to play to put Wayne up 51-46 but Maci Rhoades buried a 3-pointer to make it 51-49. With 16 seconds left Alyssa Hall drew a foul and sank both free throws to tie it 51-51. Hampton got fouled by Kirsten Williams and sank both shots with 14.6 seconds left. Alyssa Hall drove the left side of the lane to score and drew foul from Bohanon with 6.9 seconds left. Hall sank the free throw to put ‘Creek up 54-53. Bohanon managed to score at the buzzer but the shot was wiped out by the player control foul. Trice said the strategy was to force Alyssa Hall to shoot from her right hand but she managed to drive in from the left the entire game, a fact that proved costly. She led all scorers with 21 points. Wayne: Nyla Hampton 4-2-11, Kyra Willis 3-1-7, Destiny Bohanon 5-4-17, Olivia Trice 3-0-7, Aubryanna Hall 3-3-11. Totals: 18-10-53. Beavercreek: Maci Rhoades 2-0-6, Alyssa Hall 8-3-21, Tiernan McKitrick 0-1-1, Morgan Rhoades 1-0-2, Maggie Holstein 2-0-4, Kirsten Williams 4-4-12, Taylor Steinbrunner 2-2-6, Anna Landing 1-0-2. Totals: 20-10-54. 3-point goals: Wayne 7 (Bohanon 3, Hall 2, Hampton, Trice); Beavercreek 3 (Hall 2, M. Rhoades). Records: Beavercreek 2-2 (2-0), Wayne 3-1 (1-1).